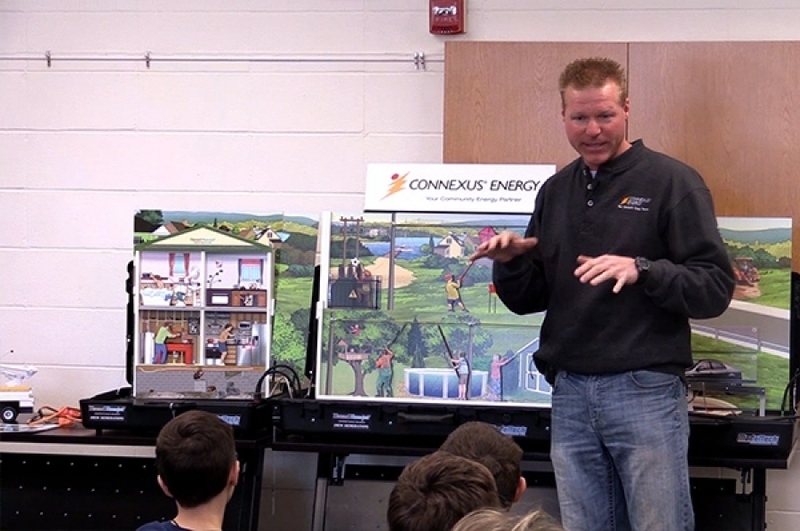 Home > 20 years of energy safety awareness using the ‘Hazard Hamlet’ simulator. Terry McAlpine has worked as Public Safety Coordinator for Connexus Energy in Minnesota for 20 years. After making extensive use of the Hazard Hamlet Electrical Safety display manufactured by Modeltech Int’l. , Terry had the opportunity to work with the new-generation el of this best-selling safety model. “Recently, we updated to the ‘Hazard Hamlet new generation’. This exciting new concept offers a choice of 3 modules to suit your targeted audience and your budget. Improved features include larger real-life characters, realistic graphics and a wireless remote that adds a lot of flexibility to your presentation, says Terry. He also mention that the loud arcing effect is always highly effective at grabbing kids’ attention. As mentioned in a previous article, the new 811/911 module provides additional hazards, such as a back-hoe hitting an underground cable – a reminder of the important ‘CALL BEFORE YOU DIG’ safety awareness program – and a car accident. In this case, multiple hazardous situations can be recreated, like how to escape a vehicle touched by a downed power line, the risk associated with the ground gradient phenomenon and energized bodies, and even the shocking hazards of touching a guard-rail ! To read the original story of the new 811/911 module, CLICK HERE. After more than 30 years of service, Terry McAlpine recently retired from Connexus Energy. We wish him a happy – and safe – retirement! Multiple hazardous situations can be recreated – like the shocking hazards of touching a guard-rail!